You are an administrator for a company which currently maintains several Domain Controllers. 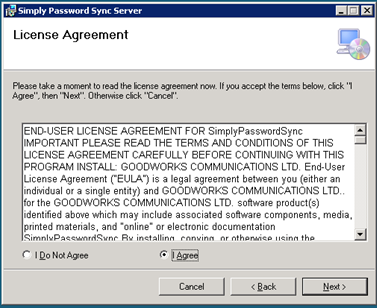 A decision has been made to implement Simply PW Sync Server to take advantage of password synchronization, to solve administrative challenges and to reduce operating costs. The password synchronization capability will allow the company to deliver the functionality and simplicity of single sign on into a distributed environment. This service receives password change from password client agent. 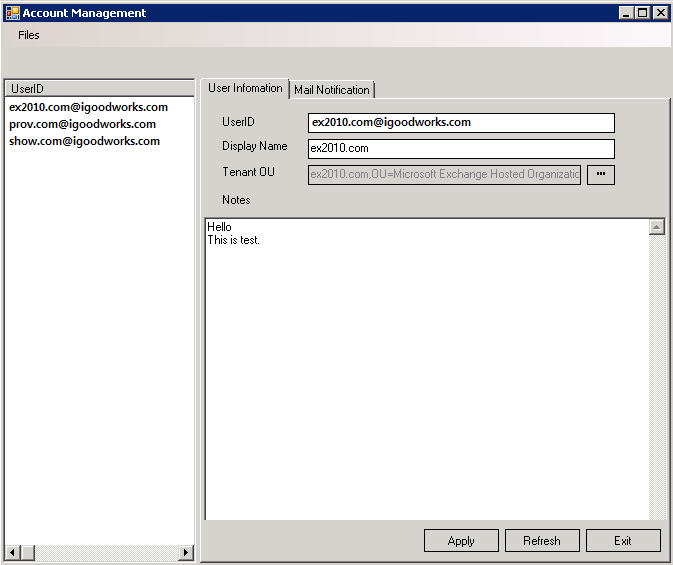 This service raise password change event and pass user id and password to server agents. 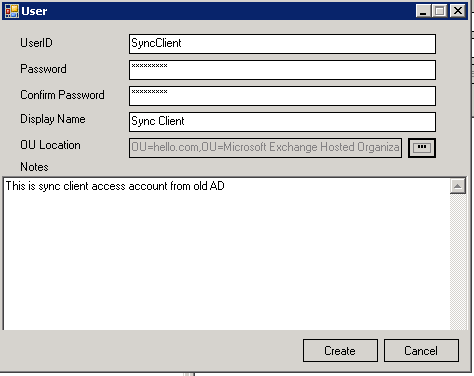 This is default agent which receive password change event from PWSync Server service and apply password change to target active directory. 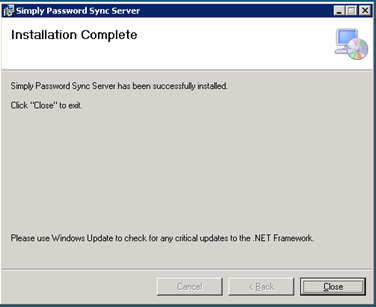 Download password sync server and extract to any local drive. In this document, we will use x64 bit module. In the previous tasks, you ensured that your environment met all of the prerequisites for installing a PWSync Server. In the following task, you will install PWSync Server on the appropriate computer. 2. On Server, Run Windows Explorer and find PWSyncServerInstaller64.msi in target folder. 7. On the Confirm Installation page, click Next..
8. On the Installation Complete page, click Close. You can use Temporary Certificates or selfsigned certificate. 12. Choose button “…” on right side of Permission Group text box and choose Security Group. For Permission Group, It doesn’t have to have any permission. Only member of this group will be accessible for synchronization. 13. Confirm PWSync Façade Service, PWSync Server Service, PWSync Active Directory Agent Service, PWSync Monitoring Service, PWSync Monitoring Mail Agent Service exist on service list. Start "Configure PWSync Server service"
PWSync Active Directory Agent Service, PWSync Monitoring Service, PWSync Monitoring Mail Agent Service, PWSync Server Service are started, however PWSync Façade Service status would be “Stopped”. 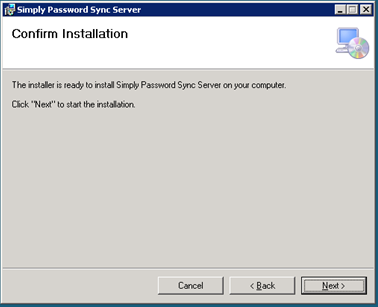 Let's start "Configure PWSync Server service" part. 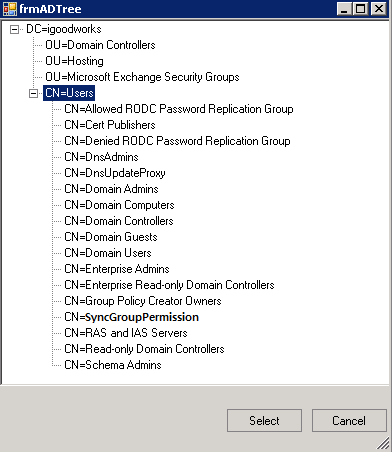 Change "Active Directory Agent Service" service account which should have permission to reset user password. 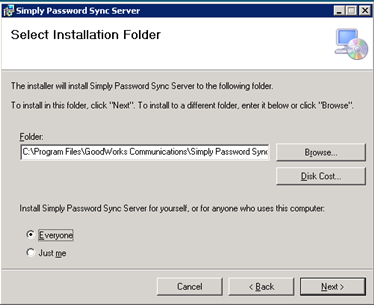 In the previous tasks, you installed and configure PWSync Server. 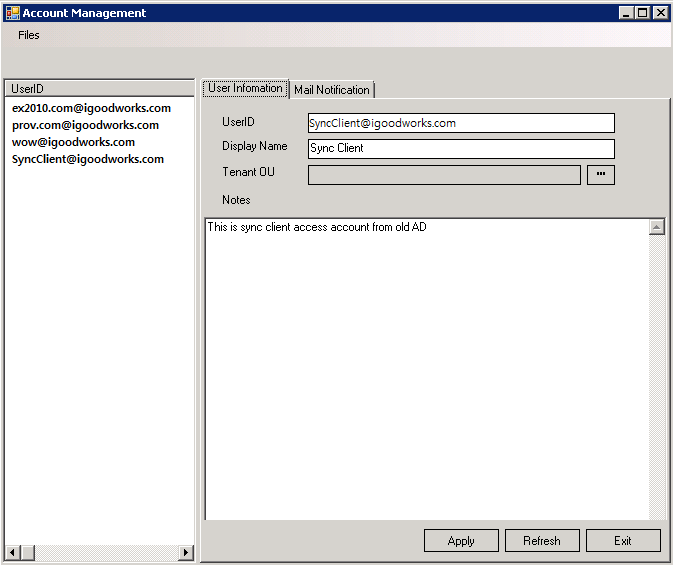 In the following task, you will create and configure client access account. 2. Choose “Tools’ and “Account Management”. 3. To create account for customer access. Choose “Files and New User”. 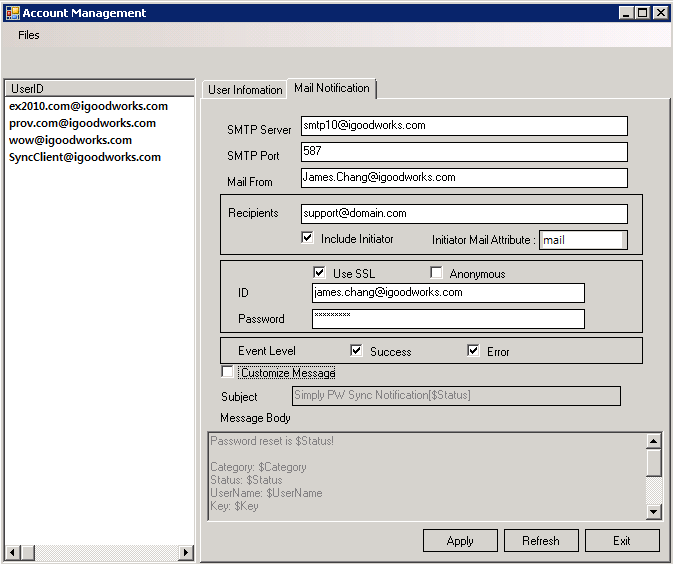 Fill out user information This account should be created per customer domain in case of hosting environment. Note. Don’t give any other permission to this account. This account is only to check authentication. •	Include Initiator: mail will be sent if this is checked. •	Event Level: notification level. If “Success” and “Error” are checked, mail notification will be sent in both cases.